There’s no feeling quite like the one you get when watching a pair of fictional characters on a beloved TV series fall in love — and get married. It’s the ultimate payoff seeing two characters you’ve invested time, laughter and tears into take that next step. Sure, they’re not real people, but there’s still nothing quite so special — and romantic — as an iconic TV wedding. From the cheesy (but perfect) nostalgic TV weddings of the ’80s and ’90s to the progressive and beautifully written fictional ceremonies of today, we’ve put together a list of the best TV weddings of all time. 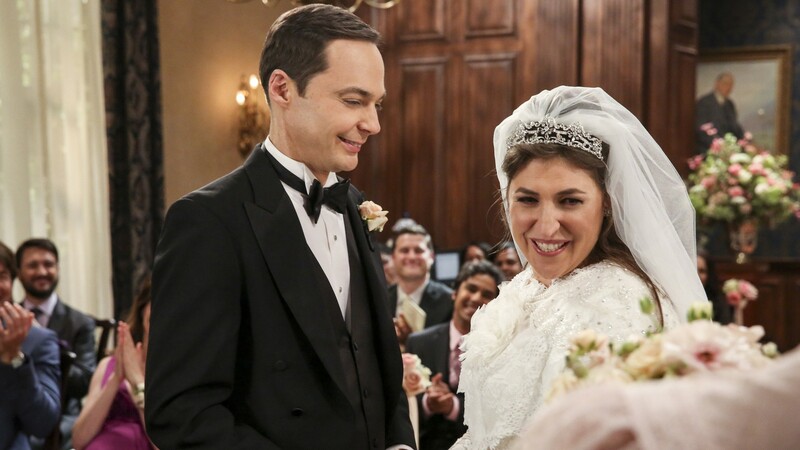 There were a lot of things that made Sheldon and Amy’s wedding on The Big Bang Theory perfect for them and heartwarming for the fans: Stars Wars all-star Mark Hamill played a fictional version of himself and officiated the wedding; Sheldon and Amy’s families showed up; we got to meet Amy’s parents (played by Kathy Bates and silent showman Teller); and there were just some generally beautiful friendship moments between the TBBT gang. This wedding was a long time coming, but when it happened, it was truly delightful. Saved By The Bell: Zack & Kelly’s Wedding from westwingwolf on Vimeo. OK, so this one was technically a TV movie, but it’s still totally iconic. The two-hour finale to this classic series was beautiful and wasn’t lacking any of the classic hijinks that made Saved By the Bell such a great show. The Office – Jim and Pam getting married dance [ JK Wedding Entrance Dance Style ] from Larsen on Vimeo. After four seasons of fans asking, “Will they?” (almost) everyone’s favorite TV couple, Jim Halpert and Pam Beesly finally got married in a touching and typically quirky ceremony at Niagara Falls. While Jim and Pam’s wedding on The Office may be one of the most memorable in recent TV history, Leslie and Ben’s may have been even better. Between Leslie’s perfect dress (Ann Perkins really made it work) and the couple’s tear-inducing vows, this TV wedding is right up there with the best of them. Someone pass the tissues, ASAP. There have been a lot of super-emotional moments on Grey’s, but Izzie and Alex’s wedding has to be in the top five at the very least. And honestly, Meredith and Derek’s decision to give their elaborate ceremony up for a cancer-stricken Izzie was a truly beautiful gesture. Raise your hand if you cried when one of the most well-known and loved couples of the ’90s got married. Is everyone’s hand raised? Good. But really, Cory and Topanga’s wedding was incredibly touching, made even more so by Cory’s absolutely gorgeous vows. Let’s be honest. These two are probably one of the most notable and beloved TV couples of all time. After watching an elaborate and sweet proposal and a few classic sitcom mishaps, lovers of Friends were finally able to watch power couple Monica and Chandler tie the knot, and it was so worth it. Liz Lemon really could have it all! After six seasons of looking for love in the big city, Tina Fey’s alter ego finally met her perfect match in Criss Chros, played by James Marsden. And of course, their wedding was just about as 30 Rock as viewers could hope, complete with a Princess Leia costume and Tony Bennett. Basically everything that could go wrong at Turk and Carla’s wedding may have totally happened, but it all (thankfully) worked out in the end. Turk may have missed the big church ceremony, but let’s be real — their vow exchange at a priest’s bedside was way more on-brand for them, anyway. In typical sitcom fashion, these long-awaited nuptials almost didn’t happen (see: Marshall’s hair mishap and Lily’s ex), but thank goodness they did. The wedding of How I Met Your Mother‘s most stable couple was simple and sweet. While all of these weddings may have been fictional, that doesn’t change how impactful or how beautiful all of them were. These weddings definitely left an impression and surely there will be plenty more TV weddings to come that will stick with us in the coming years.